(Nanowerk News) Considerable progresses made in controlling quantum gases open up a new avenue to study chemical processes. Rudolf Grimm’s research team has now succeeded in directly observing chemical exchange processes in an ultracold sample of cesium atoms and Feshbach molecules. They report on their findings in the journal Physical Review Letters ("Magnetically Controlled Exchange Process in an Ultracold Atom-Dimer Mixture"). Complex processes, which to a large extent cannot be observed directly, determine when chemical reactions build molecules or conversely release molecular bonds. Some of these processes need energy (endoergic processes) and others release energy (exoergic processes). 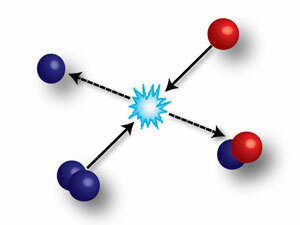 For the first time, great progresses made in the field of ultracold atomic and molecular gases have facilitated the realization of elementary chemical processes in a fully controlled way, where all particles can be prepared in a specifically defined quantum state. In an international first, together with American researchers, Rudolf Grimm and his team of physicists have now succeeded in directly observing and also energetically controlling an exchange process in a quantum gas. “Our experiment showed that it is possible to control exchange processes involving ultracold molecules“, Grimm says excitedly. The research group led by Wittgenstein awardee Rudolf Grimm of the Institute for Experimental Physics of the University of Innsbruck and the Institute for Quantum Optics and Quantum Information (IQOQI) of the Austrian Academy of Sciences (ÖAW) assumes a leading role in the research on ultracold quantum gases. For example, in 2002 the physicists produced the first Bose-Einstein condensate of cesium atoms. This success was followed by the realization of a first Bose-Einstein condensate of molecules and a Fermi condensate. The quantum physicists are now able to produce more complex molecules in ultracold quantum gases. “A totally new field of research opens up, which promises possibilities to study diverse chemical reactions in a controlled way by using ultracold quantum gases,“ explains Grimm.